In celebration of the 65th anniversary of Topps baseball cards, my collection is going to be the subject of this year-long series. Shortly after starting my obsession in 1971, my goal was to have at least one Topps card from every year. 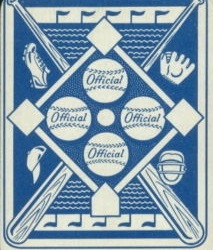 Although the 1952 set is considered to be the first released by Topps, the company issued two series that was a part of a game a year earlier. Featured here from the 1951 group of 104 cards known for the red and blue backs are Johnny Sain and Wes Westrum. Sain has a blue back and is shown as a member of the Boston Braves, while Westrum’s card is a red back featuring him with the New York Giants. The 1951 season proved to be a memorable one for both players ending with a one-on-one match-up in the World Series. On Aug. 29, Sain was traded to the New York Yankees for Lew Burdette. His only appearance in the World Series against the Giants was in game six. Westrum got a single against Sain, but the Yankees won the game and the series. Overall that season, Sain was 7-14, but he was 2-1 in seven games after the trade. He would be 11-6 the following season for the Yankees and 14-7 in 1953 when he made the American League all-star team. During his time with the Yankees from 1951-1955, Sain was 33-20 and a part of three world championship teams. Sain began his 11-year career with the Braves in 1942. After serving during World War II, he returned to the Braves in 1946 and won over 20 games four times over the next five years. His best season was in 1948 as he posted a 24-15 mark and helped the Braves to the World Series against the eventual champion Cleveland Indians. 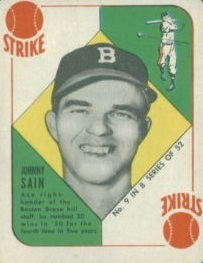 In 1955, Sain was traded by the Yankees to Kansas City as he finished his career with the A’s that season. 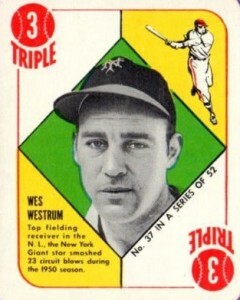 Westrum spent his entire 11-year career in New York with the Giants from 1947-1957. Known as one of baseball’s best defensive catchers, Westrum had his top offensive season in 1950. He hit 23 homers and knocked in 71 runs. In 1951, Westrum hit 20 longs balls and had 70 RBI as the Giants won the National League pennant when they beat the Brooklyn Dodgers on the famous three-run homer by Bobby Thomson. An all-star in 1952 and 1953, Westrum didn’t appear in either contest for the NL. The following season, the Giants swept the Indians to win the World Series with Westrum behind the plate in all four contests. In his career, Westrum hit 96 homers with three coming in a 12-2 New York win over the Cincinnati Reds at the Polo Grounds on June 24, 1950. During the Giants stretch run that allowed them to overtake the Dodgers for the 1951 NL crown, Westrum hit two homers in a 5-4 win over the Chicago Cubs with the final blow off Monk Dubiel ending the game in the Giants favor. Westrum’s walk-off homer would not have been needed had it not been for Chuck Connors. Connors, who became famous as the star of the television show The Rifleman in the late 1950s, blasted a three-run homer to tie the game at 4-4 in the top of the ninth to set the stage for Westrum.